"I closed my eyes and waited for the bullet"
5 years ago today, 34 mine workers were shot dead in South Africa during a bitter dispute with British firm Lonmin. Today their community is taking their demands for accountability to the firm’s HQ. 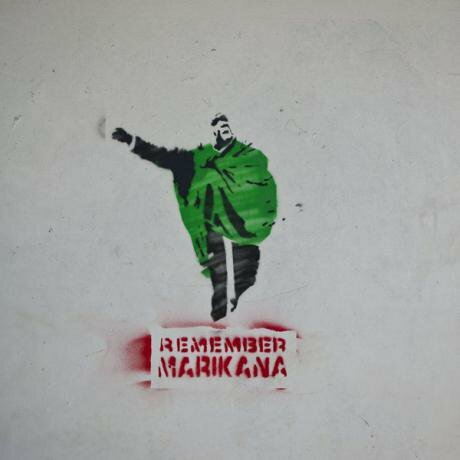 In August 2012, mine workers at British company Lonmin’s Marikana platinum mine in South Africa went on strike to demand the living wage. In the week leading up to 16 August, the workers tried to access the managers’ offices but they were pushed back by security. This was where the battle began. Pushed back from the managers’ offices, the mine workers decided to go to the koppie, a small mountain near Lonmin’s mine, outside the company’s premises. They were there for a few days waiting for management to reply to their demands, and the rest of us in the community were not allowed to go near them. Every day when the men came down from that mountain, we asked them to tell us what was going on. Ten people were killed between 12 – 14 August, including two police officers. We watched what was happening on TV constantly and in the afternoon of 15 August, we saw a crowd of people. Horses and police officers were growing in number on the koppie and, as women and leaders of the community, we were very upset. We were waiting for good news, for the management to make good decisions. Early in the morning of 16 August, we saw the barbed wire encircling the koppie and we knew that people there were going to die. We collected the women of the community and, as leaders, we said that we should go straight to Lonmin management and tell them that if they didn’t want to give the mine workers the extra money, then it was better that we take them home because the situation had become so bad. We collected the women and when we met near the mountain, we were too late. We heard the bullets, and then the ambulances. Thirty-four mine workers were shot dead. We couldn’t get there afterwards, there was a large crowd and we were told not go there, that it was very hectic. We turned back and didn’t sleep that night. Early in the morning, we went to see the police at the koppie and were fighting with them, trying everything. Then we cried. We went to the police stations and hospitals to look for the missing. We were looking for a guy that was staying in the yard of one of our houses. He didn’t come back and we weren’t sure if he died or was in hospital or jail. A month later, on 15 September 2012 we were near the koppie with Paulina Masuhlo, an ANC councillor and our good friend. The police had weapons and fought the mine workers near the koppie. They killed Paulina. I don’t know how I (Primrose) survived because I was next to her. I just took my hood and closed my eyes and then I waited for the bullet. We took Paulina to hospital where she died. After Paulina’s death, we met again as women and formed an organisation called Sikhala Sonte (We Cry Together). We organised as women in solidarity with those who died. They were brothers, fathers, friends, they were related to us. As women, we gathered together in the hospitals, funerals, prisons and courts. Sikhala Sonke is now a registered non-profit organisation and last year filmmaker Aliki Saragas approached us about documenting our community’s struggle for justice. We are in the UK to show the finished film, called Strike a Rock, and to represent the mine workers, widows, orphans and everyone in our community. We are demanding action from Lonmin because they promised to help the widows, to compensate them, to compensate Paulina’s family, but they’ve said nothing about her since. While Lonmin have given us promises, the conditions in Marikana are even worse than they were before 2012. We have no roads, toilets, running water and no proper housing. if somebody is sick they will die because the ambulances cannot reach them. Many widows were forced to work in the mines to replace their husbands because their children were starving. They had no choice. The miners that weren’t killed on 16 August 2012 were taken to prison and charged with the murders of their co-workers. Men were arrested in the days, months and years that have followed under an apartheid-era law, called the Law of Common Purpose. Some of them are still fighting charges and have recently been in court. Many of those accused have been tortured by the police and are traumatised. The whole community is traumatised. Over 30,000 people live in Marikana and most are still living in shacks. Many adults are not working and gender-based violence, domestic violence and drug-use is common. Lonmin has an obligation to the community. In its Social Labour Plan it has committed to building 5,000 houses for the community, a promise made before the Massacre to improve living and working conditions. Up until the film was released, it had built three. Sikhala Sonke has repeatedly asked why these houses have not been built, particularly as the International Finance Corporation (IFC) – the finance arm of the World Bank – paid $50 million to Lonmin in 2007 to fulfil its commitments to the community. We want to know where that money has gone. In recent months, Lonmin has built some houses, for mine workers only, but many are paying high rents. Some 4,400 homes are meant to be built by 2018, according to Lonmin’s 2016-2018 Social Labour Plan. The South African Department of Mineral Resources must get tough on Lonmin for not complying with the Social Labour Plans, because they are legally binding regulations. Sikhala Sonke participated in dispute resolution talks with Lonmin last year but we realised that it was a waste of time and decided to pull out. The company promised us each time we met that in the next meeting they would discuss our demands but, when we returned, they told us that they had no money. We didn’t demand money from them, all we wanted was justice. Neither the ANC government nor the police protected the mine workers. But now Deputy President, Cyril Ramaphosa, wants to come to Marikana and apologise. This is because he’s trying to become president. He is too late. Where were the apologies in 2012? ANC leaders should have gone to Marikana before and said sorry to those they have wronged. We are picketing Lonmin’s Headquarters in London because we want them to be held accountable for what has happened. We want them to take care of their workers and to give them a share of their profits. Over 90 per cent of Lonmin’s business is in South Africa but its headquarters and shareholders are in the UK – this is where the profits go. Our visit to the UK must make some changes for our community.